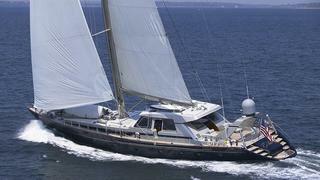 Kevin Merrigan at Northrop & Johnson informs me about a further price cut, this time $210,000, on the 35.05m sailing yacht Titan XIV. Designed by Laurent Giles and built by Valdettaro Shipyards in 1994, the steel-hulled Titan XIV is one of the largest, most comfortable cruising yachts in her class. She has an opulent European-style interior designed by Studio Garroni which accommodates 10 guests in a master and four twin cabins, and has crew quarters for six. In superb condition, with an excellent charter record, Titan XIV is Lloyd's classed and Marshall Islands Commercial Compliant, and was last refitted in 2004. Under power, with a 425hp MTU 12-cylinder diesel engine, Titan XIV has a cruising speed of 10 knots, topping 12 knots at maximum. Lying in West Palm Beach, Florida Titan XIV is asking $2,690,000, down from $2.9 million.